I will admit that I am not a big fan of the CUV and SUV craze that is sweeping through the American automotive scene. However, even I am gravitating towards the 2018 Alfa Romeo Stelvio, especially the Quadrifoglio version. I guess its the crossover’s overall design that is drawing me towards it. Or it just could be that “Alfa Romeo effect” (love at first sight) that everyone talks about. After years of waiting due to constant production delays, the 2018 Alfa Romeo Stelvio and Stelvio Quadrifoglio finally debuted at the 2016 Los Angles Auto Show. The Stelvio is based on the same chassis as the Guilia and will be assembled at Alfa’s Cassino plant in Frosinone, Italy. 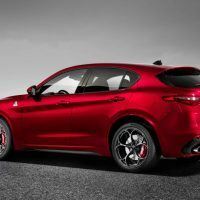 When it goes on sale, the Stelvio will be available in three trims: base, Ti, and Quadrifoglio. 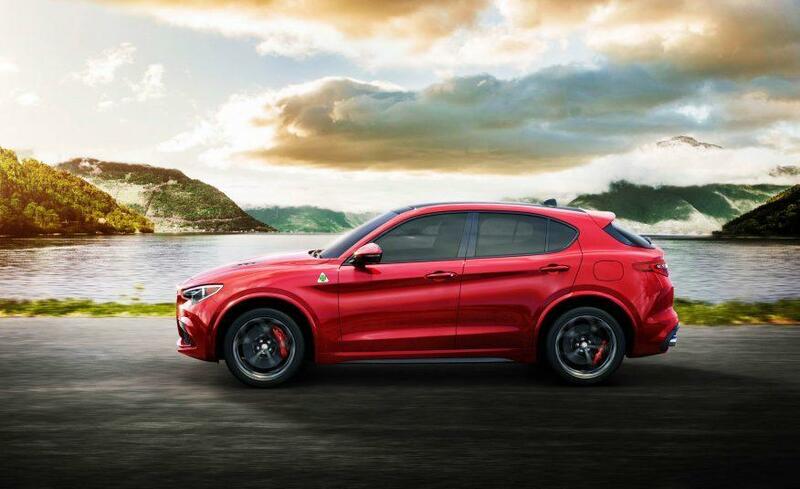 To keep the weight at a minimum, Alfa engineers have constructed the Stelvio’s front and rear subframe, suspension components (control arms up front and multilink out back), the doors, and the fenders from aluminum. The base Stelvio and Ti models are propelled by a turbocharged 2.0 L four-cylinder engine with 280 horsepower and 306 lb-ft of torque. On the other hand, the Stelvio Quadrifoglio is powered by a 2.9 L turbocharged V6, which produces 505 horsepower and 443 lb-ft of torque. 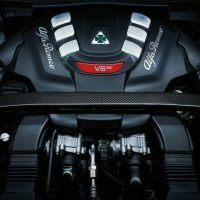 Both engines are paired to an eight-speed automatic transmission and send power to all four wheels via Alfa Romeo’s Q4 all-wheel drive system. Alfa Romeo engineers claim the Stelvio Quadrifoglio can sprint to 60 mph from standstill in 3.9 seconds with a top speed of 177 mph. The Quadrifoglio achieves these numbers by incorporating a torque-vectoring rear differential, high-performance suspension tuning, bigger brakes, and Quadrifoglio specific wheels. For additional stopping power, carbon ceramic rotors and pads from Brembo are optional. The Stelvio’s all-wheel drive system is rear drive based, but Alfa says it can transfer up to sixty percent of the torque to the front axle when needed. 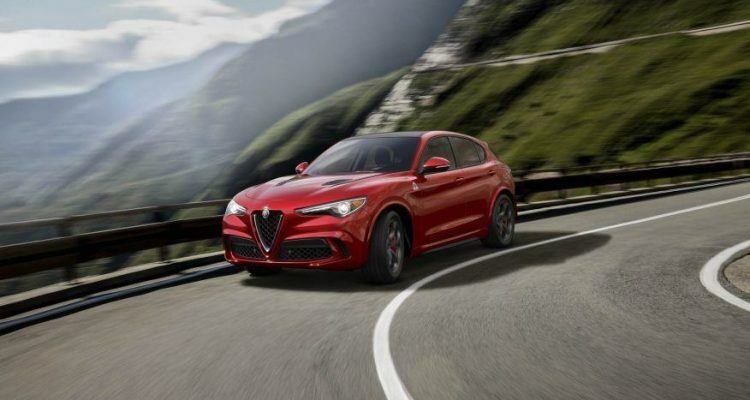 The AWD system is linked to the Stelvio’s Chassis Domain Controller (CDC) and Alfa DNA Drive Mode which enables the driver to select from Dynamic, Natural, and Advanced efficiency modes. This modifies the throttle response, boost pressure, and the settings of the adaptive suspension on the Ti and Quadrifoglio models. In the Quadrifoglio, the system is known as DNA Pro and gains a “Race” mode. When activated, it enables an overboost function for the turbos, opens up the two-mode exhaust, disables the stability control, sharpens the steering and braking response, and remaps the transmission and throttle calibrations for more aggressive response. The 2018 Alfa Romeo Stelvio is already a very attractive CUV brimming with many standard features. But if you want, you can customize it even further. The standard set of 18-inch aluminum rims are just one of seven wheel choices. Sizes of the rims range from 18 to 21 inches in diameter. For those who want something different than black, silver, and gray paint, the Stelvio’s paint pallet consists of 13 color choices. Stepping up to the mid-level Ti trim adds 19-inch wheels, plus the option of selecting either Sport or Lusso packages. 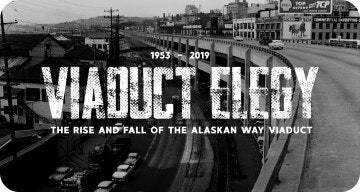 More information on these two packages will be available closer to the launch date. Inside, the Stelvio features a 7.0 inch TFT screen between two analog white-on-black gauges which provide the important info to the driver. Standard features include leather seating, Formula 1 inspired flat-bottom steering wheel, push-button ignition, backup camera, rear parking sensors, and a power operated hatch. The optional audio system is a 900-watt, 14-speaker setup from Harman/Kardon. In the mid-level Ti trim, the 6.5-inch infotainment screen is upgraded to an 8.8-inch unit with authentic wood trim. The cabin of the top-spec Stelvio Quadrifoglio features a 200 mph speedometer, a leather-wrapped steering wheel, carbon fiber trim, and a set of 12-way adjustable seats. For those who want a racecar experience in a crossover, lightweight carbon-fiber Sparco seats are optional on the Quadrifoglio. 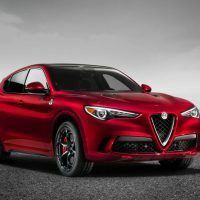 At the 2016 Los Angles Auto Show, Alfa Romeo officials didn’t announced the pricing or the on-sale date for the Stelvio and the Stelvio Quadrifoglio. But after waiting for a decade for Alfa’s return to the U.S., waiting a few more months is no big deal for me. Based on what I have seen so far, the wait for the 2018 Alfa Romeo Stelvio will be well worth it. No Comments on "First Look: 2018 Alfa Romeo Stelvio and Stelvio Quadrifoglio"